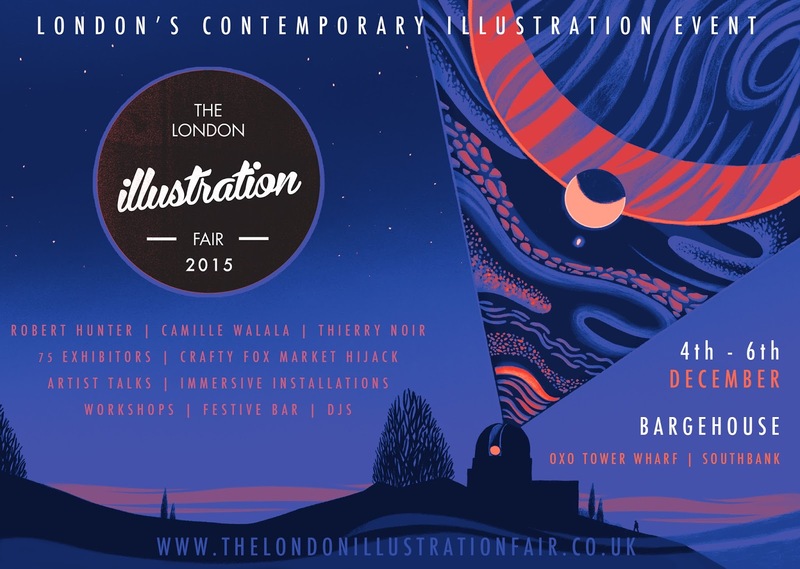 This Friday The London Illustration Fair will be taking over the Bargehouse at OXO Tower Wharf for three days in what promises to be the perfect inspiration for any creatives in the city. The Bargehouse is a four-storey warehouse in the heart of the South Bank and will be providing a cultural festive atmosphere for over 70 illustrators, designers, printmakers and publishers to exhibit their work and meet like minded artists. The fair aims to “capture the enjoyment and creativity of an industry flourishing with talent and passion” so if you’re looking for an alternative place to do your Christmas shopping and want to support emerging designers (I definitely am), this is it! As well as a selection of emerging artist led stalls there will be a handpicked selection of The London Illustration Fair’s favourite publishing houses, creative agencies, illustration collectives, print studios, galleries, crafty businesses and designers. I’ve got my eyes on featured artist Camille Walala and her geometric prints (pick up one of her limited edition totes at the show) as well as accepted artists Marylou Faure and Mariery Young. 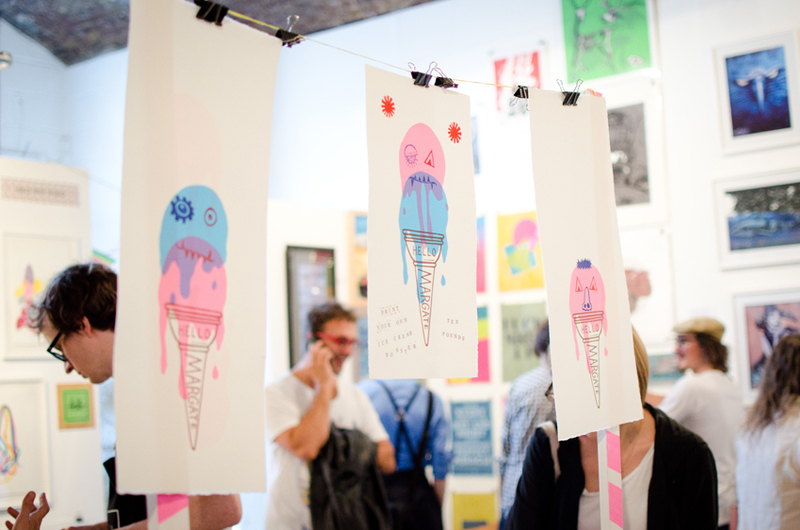 Wide Eye Editions, Unlimited, Puck Collective, Art on a Postcard and Yuck Print House are also collectives to take a close look at. One of my personal favourites, Unlimited will be showcasing their latest cheekily titled collection ‘Four Play’ in which 40 illustrators have collaborated with the design studio to create a typographic led piece. The self-initiated project explores the unique response by the chosen participants to a four-letter word given to them at random. “We wanted to engage like-minded creatives who were not only strong image-makers but open to playfulness and collaboration,” states Sara, owner of independent shop and gallery. Site-specific, immersive installations and one-off murals will also be popping up around the industrial site with the likes of Thierry Noir and Rupert Newman having been asked to participate. Noir, the first artist to paint the Berlin Wall, will be creating an interactive, three-dimensional installation in the courtyard whilst Newman, CultureLabel’s Artist of the Year, will be revamping the exterior walls of the gallery with an eclectic live video mapping show. For an even more jam-packed experience, London market extraordinaires Crafty Fox will be selling handmade one-off gifts and seasonally appropriate items from a selection of their premium designer-makers. To match the holiday spirit there will be a winter warmer bar and live DJs for you to get a little jolly whilst you peruse the Christmas offerings. I’ll be doing ALL of my christmas shopping with a glass of mulled wine. Be sure not to miss out on the programme of artist-led talks or variety of workshops and do let me know if anything catches your eye if you go!